It’s been a week since I’ve seen Hereditary, and I cannot stop thinking about it. I also can’t wait to see it again. It’s the kind of film that leaves an imprint on the viewer and I don’t think I’ll be forgetting about it for quite some time. Some scenes, I might not ever forget. 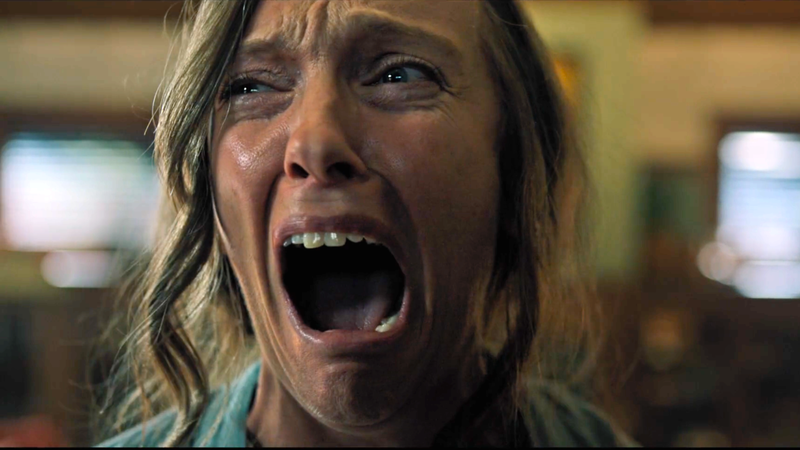 I saw the initial trailer for Hereditary back in February and I was one hundred percent onboard. A masterful trailer for a horror film from the studio of A24, say no more! Everything I’ve seen from A24 has been exceptionally well-done and the two-minute trailer they released to promote this movie was every bit of screwed up but left me drooling for more. The film stars Toni Collette as Annie Graham, a grieving woman who begins the film giving eulogy at her mother’s funeral. She’s had to deal with loss in the past, but in addition, severe mental illness exists in her family as well. Her mother, Ellen, suffered from dissociative identity disorder and in her older years severe dementia. Her brother suffered from schizophrenia and her father struggled with severe depression before passing on much too early. This is where the title comes into play, as Annie (Collette) is a mother and wishes not to see her children suffer in any way as she’s accustomed to seeing past family members in direct heritage do so previously. Annie has a lot on her plate. She makes a living creating miniature models and it’s looks as if it’s possibly a coping mechanism for her, as well. However, it’s also clear throughout the film she has a deadline to meet which adds even more stress for her to handle. She lies to her husband (Gabriel Byrne) some nights about where she’s going because she’s possibly ashamed of her dependence of group grief counseling. She doesn’t have a strong relationship with her teenage son (Alex Wolff, who’s brilliant here) and her daughter, Charlie (Milly Shapiro), mostly keeps to herself. Did I mention she might be seeing apparitions, as well? This leads her down an unraveling path of trying to figure out more about her mother’s life, taking a huge toll on Annie’s mental strength and a hell of a terrifying journey for the viewer. I can’t express enough how incredible Toni Collette is in this role. She is far and away at the top of her game here. Her ability to display a wide range of emotions throughout this nightmarish rollercoaster is unmatched. As a grieving daughter haunted with despair while trying to unravel a mystery about her mother’s past while concerned for the well-being of her own kids, Collette nails every bit of this role and it never gets easier for her throughout the film. About a third of the way through the film, she’ll have you entirely fixated on her performance and you’ll realize you haven’t seen anything like it all year. Hopefully the Academy will remember her in six months time, because as of right now, she absolutely has to be nominated. Also at play here is first time writer and director, Ari Aster, whom if I hadn’t told you otherwise you’d think was an experienced veteran behind the camera after seeing this film. Aster is masterful in every aspect of the word with his writing and direction of this film. He showcases exemplary shots throughout the film creating tension at the most opportune times. There are scenes in which his shots are framed so well that you may be focusing on what’s happening with our characters, but out of the corner of your eye you’ll distinguish something terrifying in the shot that you didn’t even know was there the whole time. Other times, we’ll be presented with the knowledge of something terrible that’s happened but he’s very particular in letting the tension build before showing you the aftermath, if he shows you at all. Every choice he makes with this movie is incredibly effective. Typical jump scares anymore involve something jumping at the camera or a frightening image accompanied by some loud high pitched music to get the full startling effect on the viewer. You have none of that here. In fact, you have quite the opposite with a simple click of the tongue that could have the viewer on edge. Hereditary is the most unnerving and hauntingly terrifying movie I’ve seen in quite some time and I can’t think of anything like it. I definitely can’t stop thinking about it either. My initial reaction when the credits rolled was wanting to start it over immediately so I experience it all again and try to piece things together once more. The performances are top-notch and the build-up to the last act is so incredibly well done that you won’t even realize how hard you’re gripping your seat. There are moments where my jaw was dropped for a embarassing length of time. Other viewers were gasping or even had their hands in the air for just as long as the events transpired on screen. So far, this is the horror film of 2018, and I wouldn’t be surprised if it stays that way.